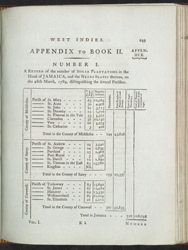 This is the appendix to Volume 2 of Bryan Edwards' work 'The History, Civil and Commercial, of the British Colonies in the West Indies,' and is a table detailing the number of sugar plantations on the island of Jamaica in March 1789. The table is divided by parish (Middlesex, Surry and Cornwall) and shows the number of slaves working on each plantation. We can see that there were 710 sugar plantations with 128,798 enslaved people working on them.